The streamlined "Kneeler" starred at the 1953 London Motorcycle Show. Though Norton had always claimed that its competition machines were virtually identical to those sold to private riders, this time they seemed to have overlooked that old principle. After secret trials of its revolutionary aerodynamic shell at the Montlhety track near Paris and on the Isle of Man, the Kneeler was ready to race against the multi-cylinders, which were becoming a dominant force. Its basis was the classic Manx 350 in a highly modified Featherbed frame. Only the lower tubes and the steering head had been retained. The two upper tubes were lowered and, passing either side of the cylinder head, were extended into a raised girder framework at the rear to support the dampers. To keep the center of gravity as low as possible, the long, low fuel tanks were installed on either side of the engine and their upper surfaces were specially shaped to form elbow and knee rests for the rider. A mechanical pump was driven off the intake camshaft to lift the fuel to the carburetor. This amazing machine raced at the North West 200 in May 1953. Ridden by the great rider Ray Amm, it managed only three laps when carburetor problems put it out of the running - but not before it had broken the lap record! 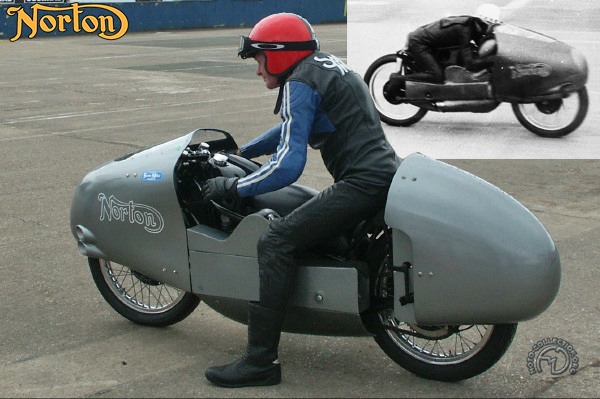 The Kneeler did not reappear on the track until November 1953 - and then it broke 33 world records on the banked Montlhery circuit - including the AllComers' World Record at 133.7 mph, a higher average than Taruffi's 1939 record established on a supercharged Gilera 4. Today, former world champion Sammy Miller preserves the Kneeler at his museum; alongside him is a photo of Ray Amm at the North West 200.